Welcome to day 2 of the 12 Days of Giveaways! Did you enter yesterday’s giveaway? If not, you can find all the giveaway links here. Okay, let’s get to today’s giveaway. There is one thing I think about getting done every single year, and every year, I put it off. And then I regret putting it off. I want to get custom paintings done of all the dogs. 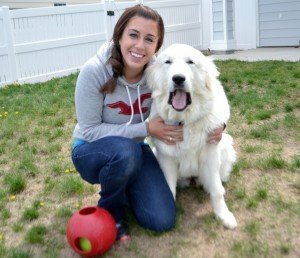 In fact, I’m pretty sure I put it into my Gift Guide for Great Pyrenees Lovers almost every year, which is why I’m super excited for today’s giveaway! I learned about Aquila Watercolor recently and let me tell you, I’m obsessed with her work. I can’t be the only one completely captivated by her work! I mean, seriously, just LOOK AT IT. Concerned about the cost? No problem. She offers three sizes to suit every budget. I also love that she used her sweet daughter to showcase the different sizes available. If you’re looking for something a little different, you can also find gorgeous artwork prints of various animals, flowers, and landscapes on her Etsy shop. I am so down for her printable coloring pages, too. Jessica has offered to create an 8×8 custom portrait for one lucky winner. But, if you can’t wait to find out if you’re the winner or know the perfect person to gift a portrait to, you can head to Aquila Watercolor‘s website to put in your custom order today! Enter the giveaway below for your chance to win a custom portrait of your pet! I would get my little shih tzu baby painted! I think I would choose Gunner, our Australian Shepard. I would have my Boston Terrier, Rozy, painted. She passed away 2 years ago and I still miss her. Her work is beautiful. I would love to get a painting of both pups but if I had to choose 1 it would be Cody because he is my heart dog just don’t let Nala know that. I would definitely get my lost piece of my heart, Toby, painted. I would love to have a painting of my dog Missy who passed away a few years ago from cancer. i would have my oldest painted, Tressa. she has been very sick lately. she is 9. I’d like to have my dog Emmett painted. Is it possible to get multiple pets in one painting? I’d have to think long and hard who to get. We don’t have anything painted of Yoda yet, but we do have some pieces of Bean, so I’d likely go with Yoda so he is represented on our walls equally! I would have my dog Coco that just passed away on October painted if I won. I would love to have my older boy who is 13 painted. Picking just one of my pets to have the portrait done would be hard. I’ve had so many I lost who I’d love to have a watercolor of, and of course the dogs and cats I have now. I think I’d go with my boy Seiji. He came from a high-kill shelter in NC just over six years ago. We had issues with him at first – I think he had been abused. It took time and lots of TLC, but now not only is he the most loving dog, but has gotten playful and puppish (even though ht’s almost nine years old now). I have been really bonding with Seiji lately and I’d love a portrait of him. I would want my dog, Artie painted. I would probably have my current dog Gibbs done he is a one year old Goldie. I would get my dog, Bunny, painted. She is very photogenic and I think she would be a really pretty portrait! Plus she is the smartest gal I have ever had the privilege of knowing!